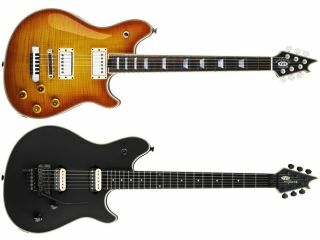 EVH has announced two new variations of the Eddie Van Halen-designed Wolfgang model: the Wolfgang USA Custom and the Wolfgang Stealth. The USA Custom features a mahogany body, maple top, mahogany set-neck, ebony or rosewood fingerboard, dual EVH Wolfgang Custom nickel-covered humbuckers, and a stop-tail bridge. Available in Black, White and Vintage Cherry Burst. The Stealth model is a sleek, all-black affair with basswood body, maple neck, ebony fingerboard, dual EVH Wolfgang humbuckers, and an EVH-branded Floyd Rose locking tremolo. Availability and pricing is TBA. The press release below includes more detailed spec. See EVH Gear for even more. "EVH is proud to introduce two new Wolfgang guitar models, the Wolfgang USA Custom and the Wolfgang Stealth. Both are distinctive variations on the hugely successful original model, the U.S.-made EVH Wolfgang guitar designed by Eddie Van Halen. "Perhaps the most uniquely elegant instrument in the Wolfgang series, the Wolfgang USA Custom represents Eddie Van Halen's personal tribute to the short-scale set-neck guitars of the late 1950s, combined with the distinctive modern personal touches he prefers on his own guitars. These two elements culminate in a truly magnificent tone machine embodying the best of yesterday and today. "The guitar's mahogany body has a 0.5" arched maple top and seven-ply binding, a bound mahogany set neck with dual graphite reinforcement rods, and a 24.75" scale length. "Features include a compound radius (12"-16") ebony or rosewood fingerboard, 22 vintage stainless steel frets, seven-ply headstock and body binding, mother-of-pearl headstock logo inlay on ebony, dual EVH Wolfgang Custom nickel-covered humbucking pickups with three-position switching, stop-tail bridge with fine tuners, EVH custom tuners, dual EVH custom low-friction 500k volume pots, dual EVH custom high-friction 250k tone pots and an EVH molded-stripe case by SKB. "Available in Black, White and Vintage Cherry Burst. "In designing an especially sleek all-black addition to the Wolfgang series, Eddie Van Halen decided to try something he previously wasn't known to prefer - an ebony fingerboard. He liked it so much that the resulting guitar - the Wolfgang Stealth - now resides at the very forefront of his arsenal. "Features include an arch-top basswood body, quartersawn maple neck with dual graphite reinforcement rods, compound radius (12"-16") ebony fingerboard with 22 vintage stainless steel frets, dual hard-mounted EVH Wolfgang humbucking pickups with three-position switching, dual Bourns low- (volume) and high-friction (tone) potentiometers, EVH-branded Floyd Rose locking tremolo with EVH D-Tuna, black hardware, EVH-branded 14-1 Gotoh chrome tuners with pearloid buttons, Schaller chrome string retainer and EVH molded-stripe case by SKB.